Hmmm, there's always That Awkward Moment when the star of a film goes into rehab just before his new movie is released, or Daily Billboard thinks cynically, is that a stroke of PR luck (or perfectly planned publicity). Zac Efron stars with Michael B. Jordan and Miles Teller as three best friends exploring that age old dating question with the girls in their lives, "just where is this relationship going?". Not only does this ad campaign look like it's for a new season TV sitcom, rather than a big screen movie, but it also has the dubious honour of opening on NFL Super Bowl weekend. Ouch! 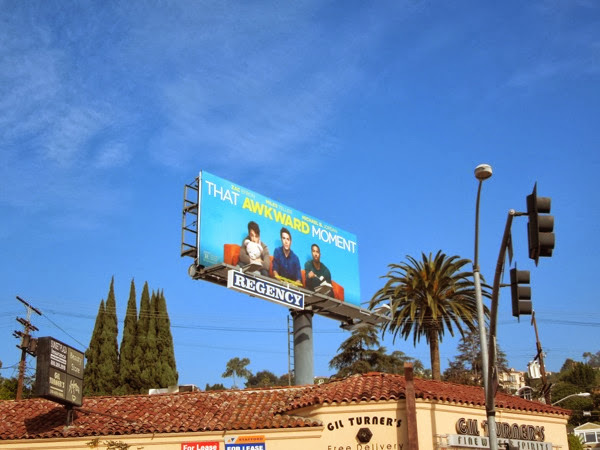 Having said that, the blue background with a burst of yellow of the ad creative certainly does pop amidst the crowded L.A. skyline, catching your eye from near and far. 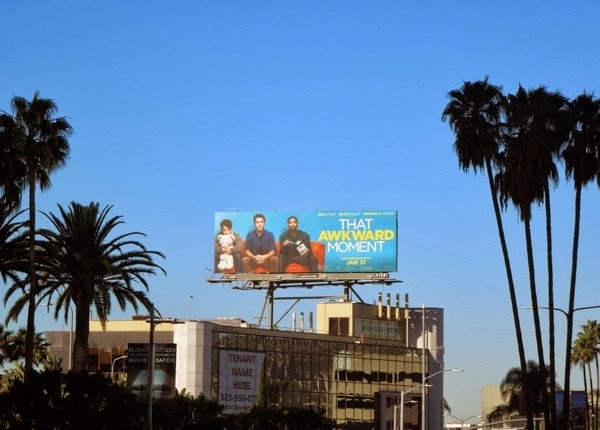 These movie billboards for That Awkward Moment were first snapped on January 7 along La Brea Avenue and were also photographed through January 22, 2014 along Sunset Boulevard, Melrose Avenue and Wilshire Boulevard. If you're a Zac Efron fan, be sure to also check out this Charlie St. Cloud movie billboard, plus these film billboards for The Lucky One. And for this romantic comedy, let's hope the ice-cream, teddy bears and cute boys can help win over the female audience who may not be as interested in the football this weekend.